he best strawberries you’ll ever taste will come from a garden, because fully ripened strawberries have a rich, aromatic flavor unmatched by their supermarket counterparts. Savoring the melt-in-your-mouth juiciness of freshly picked strawberries is but one reason to grow your own. As the first fruits to ripen in spring, strawberries are nutritious assets to any garden. The sturdy little plants prosper when planted in properly prepared beds or rows, or you can put them to work as edible edgings or let them sprawl over the top of a wall. Strawberries are happy to grow in strawberry jars and hanging baskets, too. Exhausted from producing fruit and offspring, strawberries typically take a second rest period during summer’s second half. When kept weeded and lightly watered, most parent plants – and their offspring – perk up and grow again for a while in the fall. Even though it may look like little is going on with strawberries in September, the plants are busy during the fall months developing the latent buds that will grow into next spring’s flowers Mulch, such as straw (as pictured here) or black plastic, helps keep the soil moist and the fruit clean. 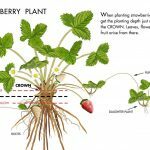 From zone 6 northward, strawberries are best planted in spring so they will be well-rooted by the following winter. Containers can be replanted in late summer and moved to a cool, protected place such as an unheated garage during the coldest months. From zone 7 southward, strawberries can be planted in fall. (In Florida and other warm, humid coastal areas, many are grown as cool weather annuals.) Once a planting is established, simply lift your healthiest plants each September, and replant them in a freshly renovated site. Growing strawberries doesn’t have to entail so much work, though. 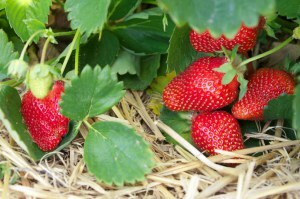 In all areas, strawberries can be allowed to grow into a vibrant green ground cover that requires little maintenance. The plants won’t bear as heavily as more intensively managed plants, but they will still produce delicious berries, year after year. 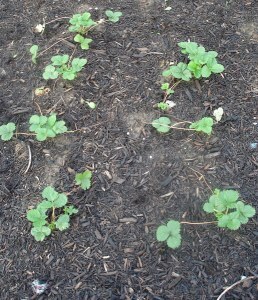 These young strawberry plants are sending out runners (the shoots to the left). 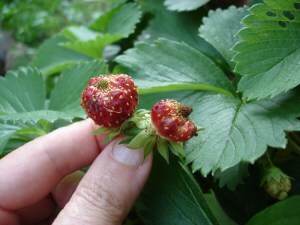 If your strawberry plants produce runners, clip most of them to allow the mother plant to produce more fruit. Strawberries need at least 8 hours of full sun each day, and they prefer slightly acidic soil with a pH between 5.5 and 6.8. If soils in your area are naturally alkaline, it is best to grow strawberries in half-barrels or other large containers filled with potting soil. Strawberries may also sulk in heavy clay, which should be generously amended with composted leaves, fully rotted sawdust, or another bulky type of organic matter before planting strawberries. After mixing in 4 inches or more of compost, rake clay soil into raised mounds to further improve drainage. If your soil is sandy, simply cultivate to remove weeds, and mix in a 1-inch layer of rich compost or rotted manure. Many varieties of strawberries eagerly produce offspring, so it is best to space them 18 inches apart. There are a few varieties, though (such as Loran), that produce few if any runners; these can be spaced 6 inches apart. (Check the tag for exact details on spacing.) Be sure to set the plants so that their roots are well covered with soil but the central growing bud, or crown, is exposed to light and fresh air. This is very important: If you bury the crown, the plant could easily rot. Water them well. Any type of mulch – from black plastic to pine straw to shredded leaves – will keep the soil moist and the plants clean. Fertilize with Bonnie Herb, Vegetable & Flower Plant Food for excellent results. Look for your plants to begin blooming in early spring, and the flowers must be visited by bees and other pollinating insects before they can set fruit. In warm, sunny weather, berries ripen about 30 days after blossoms are fertilized. An arch made of wire fencing can support a row cover for frost protection, then bird netting once fruit appears. Row covers must be removed for pollination. June-bearing varieties such as Allstar bear all at once, usually over a period of about 3 weeks. Although called June-bearing, these bear earlier than June in warm climates. Everbearing varieties like Quinault produce a big crop from spring flowers, set light flushes of fruit through summer, and then bloom and bear again in late summer and fall. Fruit is ready for harvesting 4–6 weeks after blossoming. Harvest only fully red (ripe) berries, and pick every three days. Cut by the stem; do not pull the berry. Harvest will last up to 3 weeks. You should have an abundance of berries, depending on the variety. Store unwashed berries in the refrigerator for 3–5 days. Strawberries can be frozen whole for about 2 months. Watch our video on How to Make Strawberry Preserves! Try planting more than one variety. Each will respond differently to conditions, and you will have a range of different fruits to enjoy. ‘Northeaster’ is best suited for the northeastern US and southeastern Canada. Fruit has strong flavor and aroma. ‘Sable’ is hardy to zone 3, early season, great flavor. ‘Primetime’ is a mild-flavored, disease-resistant variety, best adapted to the Mid-Atlantic. ‘Cardinal’ is a good variety to try in the South. ‘Camarosa’ is a good variety to try on the West Coast. The weather may be to blame for deformed berries. Bees tend to stay in their hives during rain and cool temperatures, hindering pollination. Slugs often chew holes in strawberries just as they begin to ripen. Organic mulches such as straw encourage slugs, so where slugs are a problem, a plastic mulch helps. In summer, several fungal diseases cause dark spots to form on leaves. Clipping or mowing strawberry foliage and raking it away in summer can interrupt the life cycles of some strawberry pests and diseases. By far the worst pests of strawberries are birds. To keep robins, brown thrashers, and other fruit-eaters from stealing your berries, cover the plants with lightweight bird netting when the berries begin to ripen. Sometimes your fruit may be small because of heat and drought. Once you start watering and the weather improves , the new fruit should be of normal size.